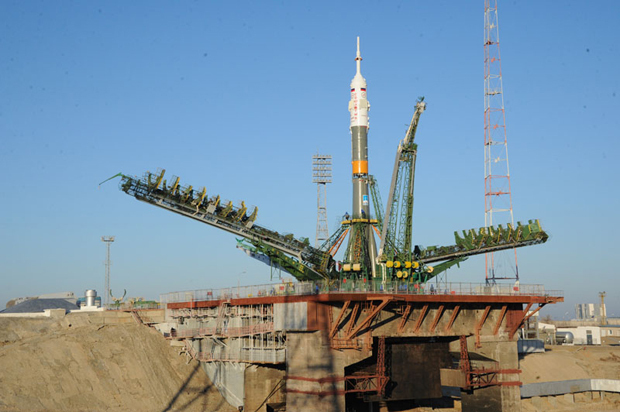 Russian ground crews prepared a Soyuz spacecraft for launch Tuesday from the Baikonur Cosmodrome in Kazakhstan to ferry three fresh crew members -- a veteran Russian cosmonaut, an Italian test pilot and an American shuttle veteran -- to the International Space Station. Boosting the lab's staff back to six, the Expedition 36 crew faces a busy stay in space highlighted by a full slate of scientific research, six spacewalks, the arrival of multiple cargo ships carrying critical supplies and, in early November, the Olympic torch, which will herald the 2014 Winter Games at Sochi, Russia, in February. 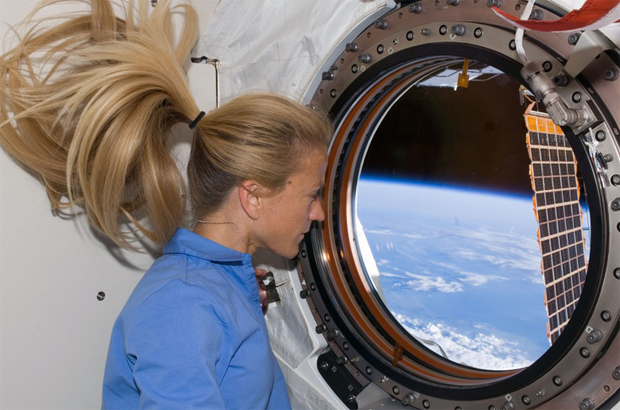 "I'm very much looking forward to living there," said astronaut Karen Nyberg, who visited the station during a 14-day shuttle flight in 2008. A shuttle mission is "a sprint, you're go, go, go constantly, and you don't have a lot of time to reflect on what you're doing as you're doing it. "In fact, there's a lot of that mission that I don't really remember," Nyberg said. "I look at pictures and I'm like, 'oh yeah, we did that.' I think with a longer period of time, I'll have time to actually get it ingrained in my brain of where I am and what I'm doing, and I won't need to go back and look at those pictures to remember what it is that I've done." Married to astronaut Douglas Hurley and mother of a 3-year-old son, Nyberg holds a Ph.D. in mechanical engineering. She said she was eager to participate in station research, but hopes to find a bit of time for her hobbies amid the hectic schedule. "I don't watch a lot of movies or things like that," she said. "To relax, I like to sew and draw, do things like that. So I've brought a sketch pad and some pencils that I can hopefully do a little bit of sketching. I brought a little bit of fabric and needle and thread. I have no clue yet what I'm going to do with it, but I'll come up with something!" Asked if she planned to follow in the footsteps of former commander Chris Hadfield, a Canadian astronaut who gained internet fame with his prolific Twitter postings, Nyberg said she was still considering how she might utilize social media. "I haven't decided yet whether I'll do Twitter," she said. "I've been using Pinterest for a couple of years and absolutely love it because of my other hobbies and have actually started my own personal account, adding some space things. I think it will be kind of neat to add on to that while I'm there if I can. Definitely, we're going to do as much as we can to share what we're doing up there with the rest of the world." Nyberg, Soyuz TMA-09M commander Fyodor Yurchikhin and European Space Agency flight engineer Luca Parmitano are scheduled to blast off Tuesday at 4:31:24 p.m. EDT (GMT-4; 2:34 a.m. Wednesday local time) from the same pad used by Yuri Gagarin at the dawn of the space age. If all goes well, Yurchikhin, a veteran station commander, will oversee an abbreviated four-orbit six-hour rendezvous with the space station, ending with an automated docking at the Rassvet module around 10:16 p.m.
Soyuz crews historically have used a more traditional two-day rendezvous sequence, but the Russians have been testing single-day launch-to-docking trajectories in recent flights to shorten the time crews are forced to spend cooped up in the cramped ferry craft. "I would like to get where I'm going," Nyberg said. "The facilities in the Soyuz aren't as comfortable as what it is on space station. So I'm all for just getting there!" Flying aboard a Soyuz is nothing new for Yurchikhin, but it will be a new experience for Nyberg and Parmitano, making his first space flight. "I really like the Soyuz. It's a solid, very reliable machine," Parmitano said. "It's fun to fly. I have the privilege of being the left seater, the co-pilot, I have to be qualified just like the commander. So I have a lot of flying time in the simulator. ... The Soyuz flies beautifully." Said Nyberg: "I think it's a fantastic vehicle, mostly in its simplicity. They're constantly making upgrades, but not making upgrades to the point where it's too complicated a vehicle. It's cozy, very cozy! Luckily, I'm not as big as Luca. I think for the bigger people it can be painful, actually, to sit in that thing." Even so, she said, "I think it's a great vehicle, and I'm really looking forward to the launch and kind of comparing it (to the space shuttle)." 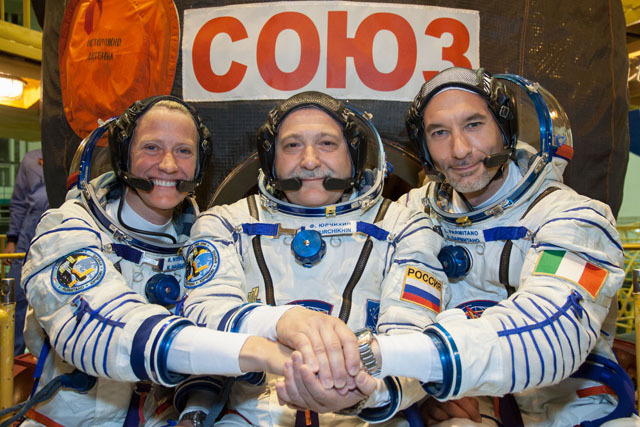 Yurchikhin, Parmitano and Nyberg will be welcomed aboard the space station by veteran Expedition 36 commander Pavel Vinogradov, rookie cosmonaut Alexander Misurkin and NASA astronaut Christopher Cassidy, who were launched to the outpost on March 28. The first major item on the agenda for the combined crews will be the undocking of the Progress M-19M/51P cargo ship from the Zvezda command module's rear port on June 11, clearing the way for arrival of a European Space Agency cargo ship, known as an Automated Transfer Vehicle, or ATV, on June 15. One question mark is the condition of a laser retro reflector on the aft port that may have been damaged or contaminated during the Progress docking April 26. The reflector will be used by the approaching ATV's navigation system to compute the ship's approach velocity and orientation. Shortly after the Progress launch last month, flight controllers discovered a navigation antenna had failed to deploy on the front end of the cargo ship. In its stowed position, part of the dish antenna threatened to contact or come in close proximity to the Zvezda docking system where the laser reflector is mounted. During a space station mission management team meeting, or IMMT, U.S. and European Space Agency managers opposed the Progress docking pending additional analysis. Russian managers, however, decided to press ahead after concluding the reflector would not be damaged. With the IMMT at a procedural impasse, space station Program Manager Michael Suffredini and William Gerstenmaier, director of spaceflight operations at NASA headquarters, discussed the issue with their Russian counterparts and concurred with docking. Some NASA insiders grumbled that the Russians steamrolled the IMMT process and that agency managers ultimately went along because they had no choice. But in an interview with CBS News, Suffredini said that was simply not the case. "If it's a U.S. spacecraft coming to the U.S. side of the ISS, our Russian colleagues ultimately have to rely that we have the detailed data," Suffredini told CBS News. "So ultimately, I wasn't the owner of the detailed data, that was all owned by the Russians. ... So, I have to rely on them being the experts. "When we called and started talking to them, they gave us absolute assurances we were not going to load up this thing enough to damage it and that if contamination was the issue ... we had a way to take care of that. And if they were certain based on their data and their findings that we weren't going to damage the (retro reflector), then I had to trust their engineering judgment." A replacement reflector is being launched aboard the Soyuz with Yurchikhin and his crewmates. If the reflector aboard the station is, in fact, damaged or contaminated, it can be replaced in a Russian spacewalk while the European cargo ship stands by. "It's an uncomfortable position to be in when we don't agree at the IMMT and have to deal with it at the next level," Suffredini said. "But had I had a compelling argument with data the Russians didn't have, couldn't have, then I very well would expect the Russians to respect our judgment," he said. In any case, when the Progress M-19M/51P cargo ship departs June 11, cameras on both spacecraft will be used to look for any signs of damage to the laser reflector. If no problems are found, the European cargo ship will be cleared for an automated docking on June 15. Unloading will begin amid preparations for a spacewalk by Yurchikhin and Misurkin on June 26 to make preparations for attachment of a new Russian laboratory module in December. "Chris and I have been training together underwater, preparing for the tasks we will be doing," Parmitano said. "It's a special challenge. Previously during the shuttle times, EVAs were highly choreographed. Everything was planned and choreographed and trained over and over again. On the station, we don't have that luxury to train as much. "So we need to be a lot more flexible. In fact, we will receive our procedures while we're in orbit and then we'll have time to study and brief each other on what we're going to do." The Progress M-18M/50P cargo ship is scheduled to undock from the Pirs module on July 25, clearing the way for attachment of a new Progress two days later. A Japanese HTV cargo ship is scheduled for launch on Aug. 3, leading to a docking at the forward Harmony module on Aug. 9. Yurchikhin and Misurkin then plan to carry out two more spacewalks on Aug. 15 and 21 to continue preparations for the new lab module. Throughout the busy schedule of spacewalks and cargo ship loading and unloading, the crew hopes to average 35 hours a week carrying out scientific research. "One of the important things we've discovered, we've seen a lot of astronauts come back with blurred eyesight," Nybrerg said. "They're doing a new study now to really look deep into that and so I volunteered to get into that because I think that's very important, especially as we start traveling farther out and spending more time away. "We really can't afford to have the astronauts or crew members come back with their eyesight decayed. So they're doing a lot of study now to try and figure out what is the problem, why that's happening so we can figure out how to mitigate it." Nyberg also plans to participate in a bone study focused on structural changes that might be caused by the absence of gravity. "Not just density changes, but structural changes," she said. "We know that we lose density, but we don't know if there's something happening in the bone where the bone actually looks different when we come back. So that's another one that we're doing." Vinogradov, Misurkin and Cassidy plan to depart and return to Earth aboard the Soyuz TMA-08 spacecraft on Sept. 11. Yurchikhin, Nyberg and Parmitano will have the station to themselves until Sept. 27 when Soyuz TMA-10M arrives carrying Oleg Kotov, Sergey Ryazanskiy and Michael Hopkins. But first, Yurchikhin and his two crewmates will oversee the capture and berthing of an Orbital Sciences Corp. Cygnus cargo ship. Orbital plans to launch the craft on a demonstration flight Sept. 12. If all goes well, the cargo ship will be berthed at the Harmony module five days later. It is scheduled to be released on Oct. 17. Orbital Sciences and Space Technologies Corp., or SpaceX, hold commercial contracts with NASA to develop cargo craft intended to make up for the space shuttle’s retirement. SpaceX’s Dragon cargo ship is already operational, but Orbital Sciences needs a successful demonstration flight before it can begin routine service in December. The Olympic torch will be launched to the station Nov. 7 aboard the Soyuz TMA-11M spacecraft carrying the crew that will replace Yurchikhin and his crewmates -- Mikhail Tyurin, Richard Mastracchio and Koichi Wakata. The torch will be carried outside during a Russian spacewalk on Nov. 9 by Kotov and Ryazanskiy. Two days later, Yurchikhin's crew will bring it back to Earth. "The International Space Station is a great achievement by many countries around the world. In my opinion, maybe one of the greatest accomplishments this world has ever seen," Mastracchio said. "The Olympics represents that exact idea, many countries getting together to compete in peaceful times and show how we can get along on this planet. 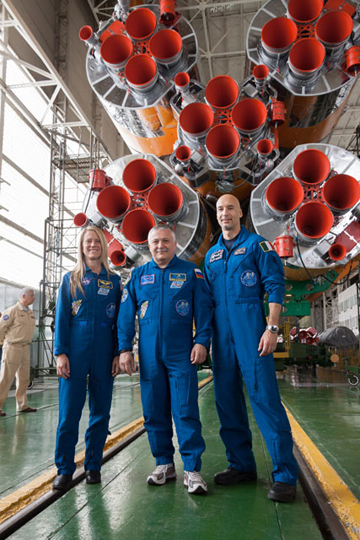 "We're going to carry up the torch, and we're going to hand it off to (Kotov's crew). They'll then hand it off to Fyodor, Luca and Karen, who'll return it to Earth. So we'll have our own relay going, around the world."